428 V8 cyl. 7016 cc 345 bhp (SAE) wb: 8 ft. The mighty Ford-engined seven-litre 2+2 has more than 345 (gross) horsepower under its long bonnet to provide 140 m.p.h. top speed. 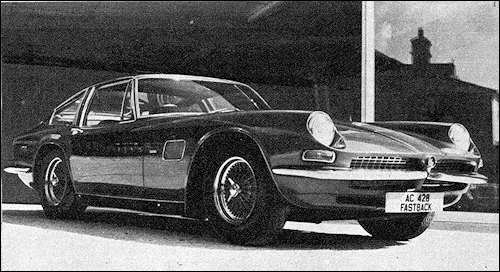 Both the Fastback and the alternative Convertible are styled by Frua of Turin. The '428' is made in the little Surrey works at Thames Ditton from whence have emanated many famous sports models (and three-wheelers) over the last 67 years. After producing their own celebrated overhead camshaft lightalloy 'six' engine for more than 40 years AC Cars now fit the big American Ford V8 to provide racing car performance.